I'm working on the 1.7.0-1 update. Please submit bugs and requests to Issues. Thanks! NOTICE: If you have performance problems with 1.5.1 and later, get the 1.6.3 release! @GregroxMun has graciously granted me permission to maintain Alien Space Programs until he's ready to take it back. Originally inspired by Little Green Men from Mars for Realism Overhaul, and by Alternis Kerbol Rejiggered, Alien Space Programs was originally three separately packaged add-ons that changed the home world to Duna, Laythe, or Eve. These offered unique challenges for our plucky kerbals. 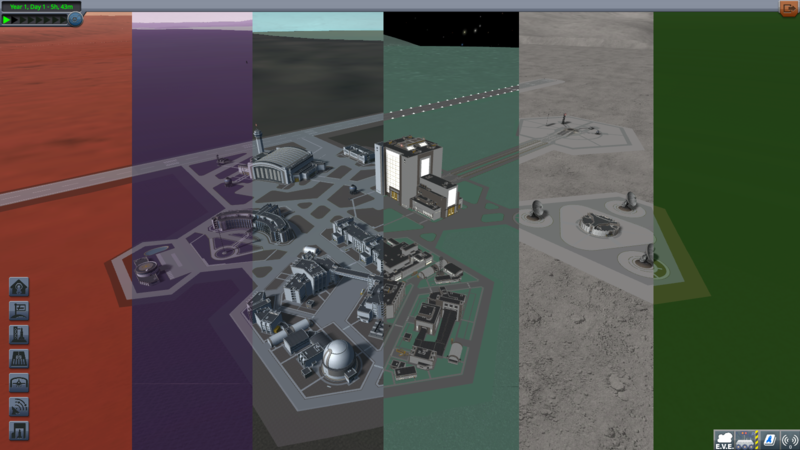 I've personally taken a shine to Eve, but these add-ons needed updating badly and I learned enough of Kopernicus to update them for KSP 1.2 to fix biomes, and later 1.3 to introduce localization. GregroxMun went a step much further, by re-packaging all of these into a single add-on with a selectable home world setting, including the original Kerbin, and provided three (four if you count Restored Duna) additional home world choices. 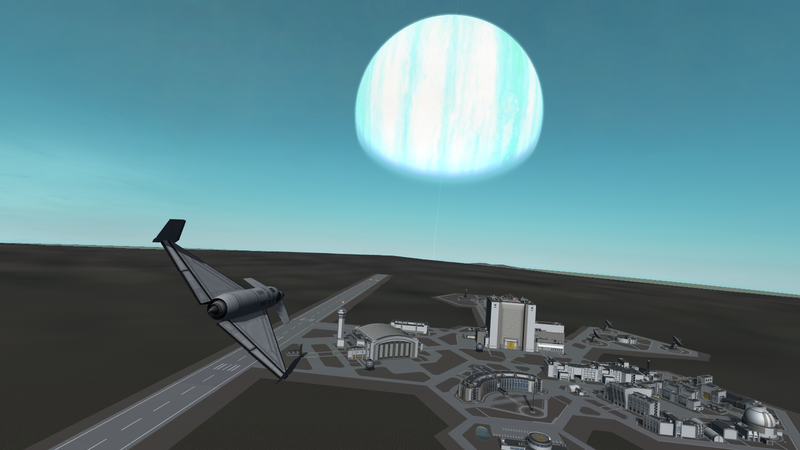 This release is up to date for KSP 1.6.1 and a matching version of Kopernicus, tested fully on Kopernicus 1.6.1-1. It may work on matching backports of Kopernicus for previous KSP versions. I don't yet have Making History so I haven't had a chance to test this against the DLC. Use a clean, stock KSP installation to start. You can copy your current installation and delete all folders inside GameData, except for the Squad folder. Make sure it starts. Exit KSP. Install Kopernicus and its included pre-requisites into GameData, and make sure KSP still starts. The main menu will open to a different view of Kerbin if successful. Exit KSP. Install AlienSpacePrograms into GameData, and make sure KSP still starts. It should default to Kerbin as the home world. Exit KSP. Edit HomeWorldSetting.cfg to choose your home world and, optionally, atmospheric and other settings. Start KSP, and your chosen home world should be on the main menu screen. Enjoy. You can keep a different save file for each home world, so you don't need to clone your KSP installation for each home world playthrough. While there's supposed to be support for changing the home world for a given save file, such as demonstrated by Hazard-ish, it seems to work best when craft are in solar orbit only. Your game play experience may vary. There are a few custom strings in the dictionary_en-us.cfg file that could be translated to KSP's other supported languages. If you can translate, please send your translation dictionary to me or fork the GitHub repository and submit a Pull Request. The HomeWorldSetting.cfg also lists challenges for seasoned KSP players. Please post challenge submissions to here, or if needed I'll start a thread in Challenges and Mission Ideas. Please submit bugs to the GitHub repository as an issue. Feel free to ask other support questions here. Be prepared to submit KSP and Kopernicus logs; GitHub lets you upload zip files and screen shots to issues without needing your own file storage host. Alien Space Programs can work with visual add-ons such as Scatterer, Environmental Visual Enhancements, Planet Shine and more. These require some attention before they will fully function. Kopernicus has an unbreakable rule that Kerbin = Home. This means there can only be one Kerbin, and it has to be the home world. However, nothing stops us from making a Kerbin and applying another world's properties to it. This is how Alien Space Programs does its magic. It also means that, if we want to have a Kerbin where we'd normally expect Kerbin to be, it can't be named 'Kerbin.' At least, not internally. This is why Kerbin is named 'Bin' internally, even if it's the home world setting. However, we can use a different display name than what the internal name is, which is why 'Bin' is named 'Kerbin' on screen regardless of home world setting. To make a visual add-on work, edit any references to Kerbin to point to Bin. That's it. Regardless of the home world setting, as long as the visual add-on uses the internal name, the add-on should still work as intended. 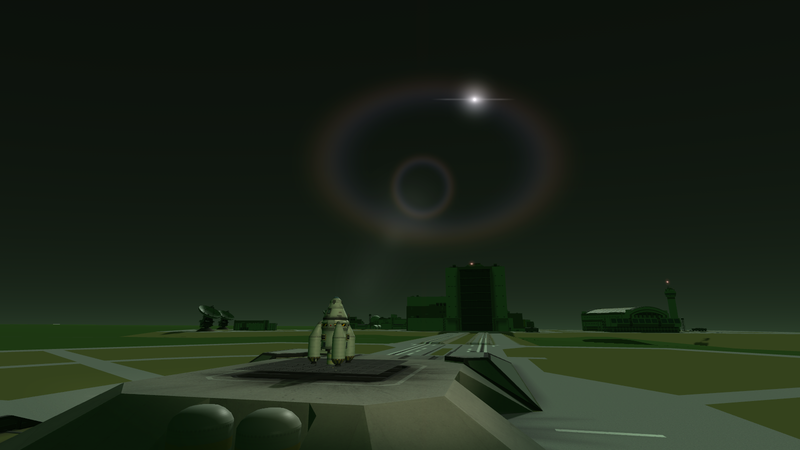 Anything that generates eclipses and shadows will need to have the Mun and Minmus cast shadows on Bin, and vice-versa, as well. The 1.5.1 release has some visual add-on configuration patches to rename Kerbin. This should allow you to drop in a visual add-on or two (or four!) and have them work without further modifications. While I included these with the 1.5.1 full release, I think these patches can work on the 1.3.0 release as well. They will go through any Environmental Visual Enhancements configurations that don't already require Module Manager, and rename Kerbin to Bin without editing them directly. There are also two sets of Scatterer patches; one for vanilla Scatterer, and one specifically for Stock Visual Enhancements, that do the same thing. Finally there are two patches for Distant Object Enhancement and Planet Shine, though I wonder if Planet Shine is now obsoleted by the 1.5.1 Scatterer. I believe these patches will address any future EVE and Scatterer configurations, and there doesn't appear to be anything beyond BorderCo, Scifi, or SVE that are in common use. However, if you encounter a visual pack with difficulty, let me know. You can make it work in the short term by renaming Kerbin yourself, or take inspiration from one of the existing patches and create your own. If you have difficulty making a visual add-on work with Bin, or if Kerbin's properties get applied to a different home world, submit a reply here. Include configuration files for the add-on in your reply. I don't think I'll use this mod myself, but I'm glad it exists. I feel like it's one of those mods you didn't *think* you need available until you actually do I'd love to see the engineering challenges or Jool and early-game Tylo. Oh, good for taking this up. Guess I should make sure if Dres Space Program still works, huh? Guess I should make sure if Dres Space Program still works, huh? I have lots of experience with Kopernicus now that I can help you, if needed. 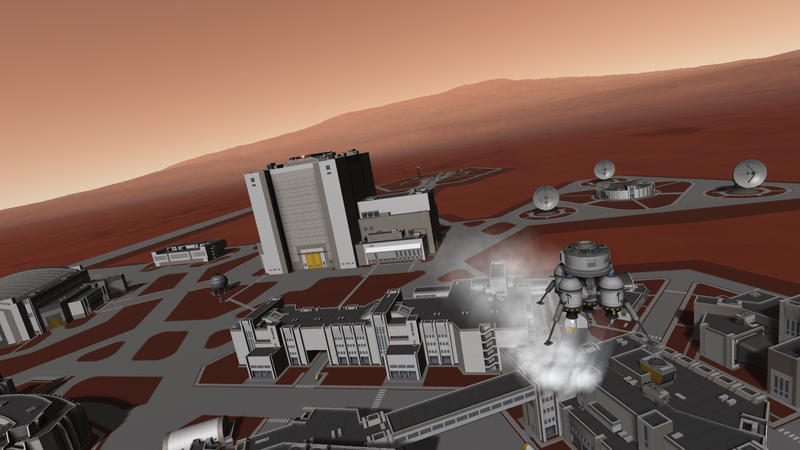 Or if it's OK, I could integrate Dres into the list of selectable home worlds here. Its biggest challenge would be the inclination compared to the rest of the system. The biggest change that breaks Dres in its current form is the Kerbin = Home requirement in Kopernicus 1.3.1-3 and later. OK, I don't see this too difficult to adapt. Expect a pull request in a few moments. Thanks for the help on updating. I'll test this out soon and we'll have people back to playing on the most exciting body in the entire Kerbal Universe, Dres! I'm wondering, would this mod be compatible with Kerbal Konstructs? I feel like it shouldn't be, but I'm far from an expert. I'm wondering, would this mod be compatible with Kerbal Konstructs? Seems OK. I could place some objects on Duna's surface with Duna selected as the home world, and those objects didn't appear to shift back to Kerbin after changing the home world setting and loading a Kerbin-based save. I can see this handy for placing high altitude launch pads on Eve. Any way i could hotfix (or juryrig) it to work with 1.4.2? Its a several mile walk from here to the nearest wifi and my cellular provider doesn't allow for wifi hotspots or tethering so I can't update ksp just yet. 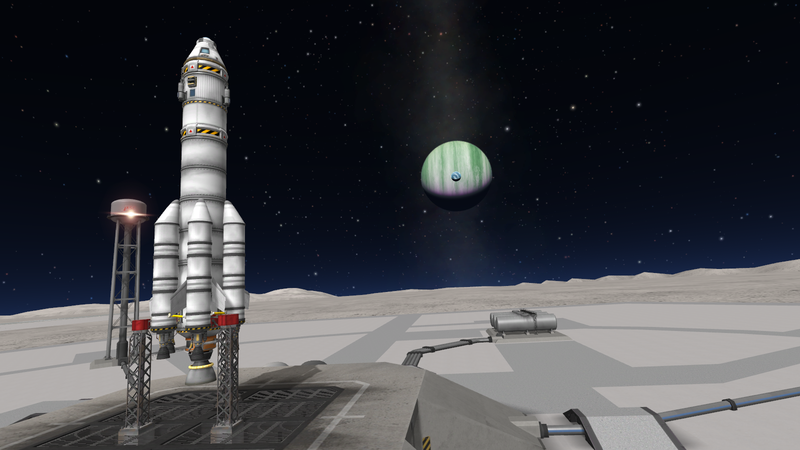 Kopernicus broke cbNameLater functionality starting from 1.4.0-x, which broke Laythe, Tylo, and Minmus. This was fixed in 1.4.3-2. And terrain tiles disappeared in 1.3.1-x editions starting from 1.3.1-4 even without a planet pack used. Wait and update KSP first, then get a current supported Kopernicus starting from 1.4.3-2. You could use 1.3.1-3, which is what the Purple Space Program series is using, but this is version-locked to KSP 1.3.1. @mr. engino Greg and I re-balanced the science multipliers for each home world, so getting to Ike from Duna should be as rewarding as getting to the Mun from Kerbin, or slightly less, for instance. The one exception is for Jool, which is more of an impossible mode challenge than anything else and we had no idea how to balance that. I'm not as sure about contract rewards, though I haven't tried a full playthrough from any place aside from Eve. Gilly becomes a Funds fountain in that setting, though considering how difficult it is to reach Eve orbit it might make sense. I'll know more once Purple Space Program reaches Duna and Kerbin. While it's possible to fill out much of the tech tree from Eve and Gilly, you have to go interplanetary to finish it, at least on Normal difficulty. The game produces milestone rewards that make sense. Distance and altitude milestone rewards on Minmus seem reasonably low given the low difficulty. The rendezvous and construction story contracts don't seem to appear in my current playthrough, though non-story construction contracts do. Surveys and 'snipe hunts' seem to work. Story contracts seem to skip some celestial bodies depending on your progress; Kerbin was bypassed in favour of Duna for me, but otherwise seem to make sense. That's for the stock contracts. I have not yet tried Strategia or whatever it's called. But career playthroughs do seem to make sense aside from maybe Jool. Good to know! One other thing, though. If I install this mod, does it affect other saves made before installing the mod? Do they stay with Kerbin as the home base, or do they get affected as well when setting a different planet as the main base? If I install this mod, does it affect other saves made before installing the mod? I would suggest making another copy of the game, or at least copy your Saves folder some place safe, before switching between home world settings. Installing any Kopernicus planet pack into a game with existing saves is always a risk because of how KSP stores craft location information in a save. So no matter what, make a backup of your Saves folder before trying it. That being said, I have one or more saves for every home world in my KSP + ASP installation. If I load a save created with a certain home world, it will load correctly when that home world is used. I don't try switching home worlds within a given save usually. The special case is Kerbin. I haven't tested trying to load a stock saved game even when Kerbin is the home world, but I think it would work. My worry is how Kerbin is named internally; it is still the second celestial body loaded (with the sun being the first) so I think it's OK, but because it's named Bin internally it might confuse other mods or parts of a stock saved game. Especially, watch out for any craft in orbit above Duna or Laythe in a stock save, because Duna's atmosphere ceiling increases by 20 km, and Laythe's by 10 km. Eve and Jool have configurable atmosphere settings to use Realistic Atmospheres or stock atmospheres so you can switch those. @BigFatStupidHead I'm looking to update this for KSP 1.4.5 and Kopernicus 1.4.5-1, which came out yesterday, but I'd like to add Dres to the next release. Might I use your config for it? I would be most happy to have you use Dres. I think there are still some problems with the config, but feel free to help yourself! 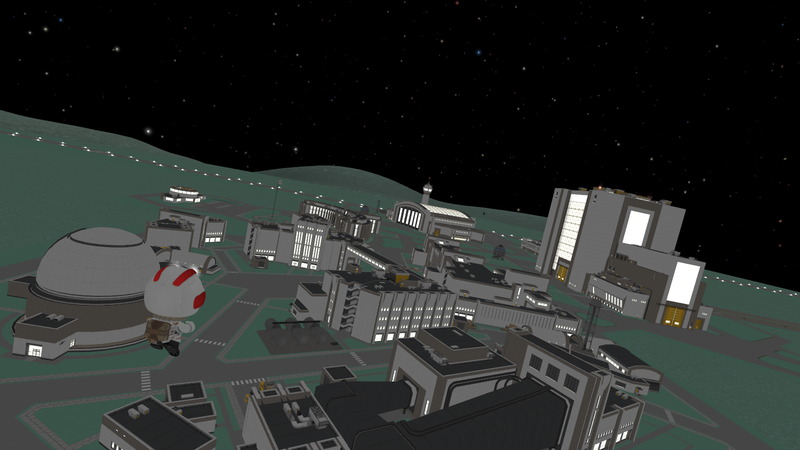 I added BigFatStupidHead's Dres configuration to the Alien Space Programs GitHub repository. No release yet, but you can download the repository from the project page. I added localization and science multiplier balancing, and integrated GregroxMun's homeworld selection configuration. Like Tylo, you'll want throttleable engines as soon as possible. But Dres won't be as harsh as Tylo. Its wild inclination makes plotting interplanetary trips very challenging. You'll want LV-N rockets sooner. BigFatStupidHead rebalanced the tech tree to give you throttleable engines and rover wheels sooner. Liquid Fuel fuselages are paired with LV-N rockets rather than jet engines. The 'Dres-teroids' feature prominently, in addition to asteroids that will spawn near the home world's solar orbit, making this a more interesting asteroid belt. Asteroid samples will be your primary space science source instead of a nearby moon. There will be plenty of them. They should also make for handy gas stations. 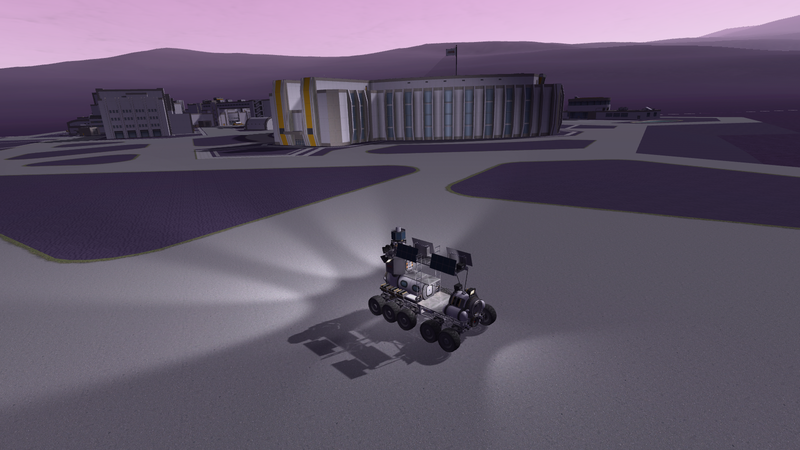 This version, and the 1.2 release, work with KSP 1.4.5 and Kopernicus 1.4.5-1 as well as 1.4.3-2. It might work on 1.3.1-9; I haven't looked at the backport yet but previous 1.3.1-x releases caused missing terrain tiles on non-home worlds with atmospheres. v1.3.0 release now available from GitHub and SpaceDock. Adds Dres as a selectable homeworld with modified tech tree, and has other comparably minor adjustments to support Kopernicus 1.4.5-4. With Kopernicus still being maintained for KSP 1.3.1, I'll try to maintain compatibility with both KSP editions. Minimum Kopernicus editions are also specified. Try to avoid Kopernicus 1.3.1-13 as it seems to have problems loading the stock system, never mind this one. Ive always admired this mod from afar. How does this mod do with planetpacks that effect the stock system? Example: snarkiverse? How does this mod do with planetpacks that effect the stock system? Example: snarkiverse? Adding new planets to the stock system should be OK, such as Outer Planets Mod. Taking a quick look at Snarkiverse, it rearranges the stock system a lot. I think it would depend on how much the other planet pack changes the stock system, and which planet was picked as the home world at the time. The big thing is the home world must be "Kerbin," even it's renamed later and has another world's properties applied to it. Anything that changes "Kerbin's" properties will have strange results, assuming the resulting system can even load. If there's enough interest I could post a support matrix of planet packs that can work with this one.